In the hot summer of 2018 I was called to a beautiful home in Exeter. The owner was having great difficulty with their lawn and had become thoroughly fed up with it. It needed a complete lawn regeneration treatment. The lawn in August 2018. It was thin, very compacted and was turfed with a poor-quality fescue grass. The main problem with this lawn was the soil. It was terribly compacted. The quality of the grass species was also a problem. Fescue turf such as this can sometimes struggle to take. It was also infested with red thread fungus and contained a lot of difficult weeds including creeping buttercups. I have worked on a great many lawns similar to this. Even though it is possible to get them looking reasonable, ultimately it will never look great. You will be throwing good money after bad. It will need to scarified often and have fungicide treatments applied annually. This is due to the difficult thatch-creating habit of fescue turf and its tendency towards fungal infections. Even after all these extra treatments, it can still look untidy as the grass leaves are so thin. The owner took the correct decision to solve the problem early on. A complete lawn regeneration and replacement with a modern grass species was planned. The plan was drastic, but carried out thoroughly was sure to bring excellent results. Total kill the entire lawn. Not only was this was needed to kill the grass, but also to control the perennial weeds which had established themselves. Prepare the soil. The soil needed to be thoroughly de-compacted. For this lawn that mean’t bringing in a medium duty petrol rotavator. This broke up the soil down to eight inches which is a good starting depth for grass roots. Bring in topsoil to level. This was quite a big lawn. Over five hundred square meters. There was also a requirement to bring the levels up at the edges. We opted for two loads of loose topsoil (totalling twenty three tonnes) and a couple of days of barrowing and raking level. Reseed the lawn. 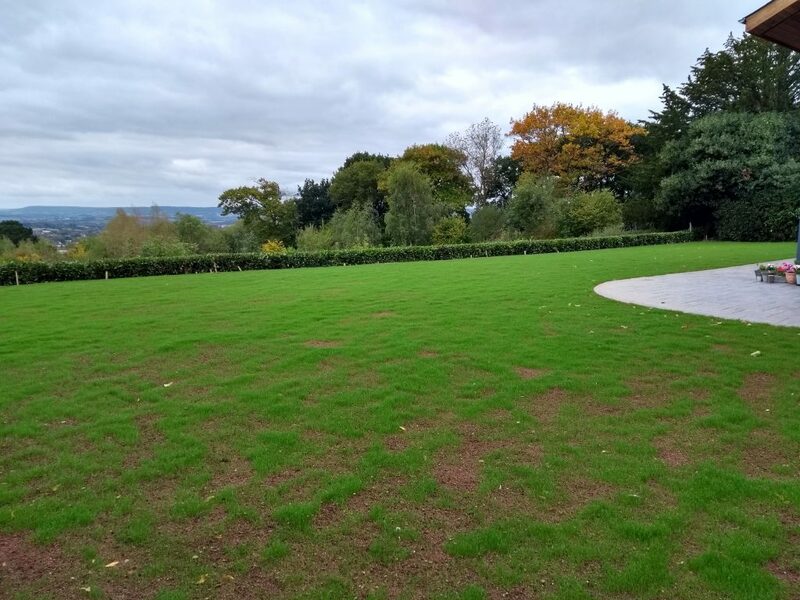 Once the soil work was completed, the lawn would be reseeded with a modern dwarf rye grass, giving the lawn a lovely finish. Autumn is the best time of year to carry out this work on a lawn. The soil is warm and the weather damp. So it was ideal timing for planning this lawn work. The lawn was killed, rotavated and cleaned. 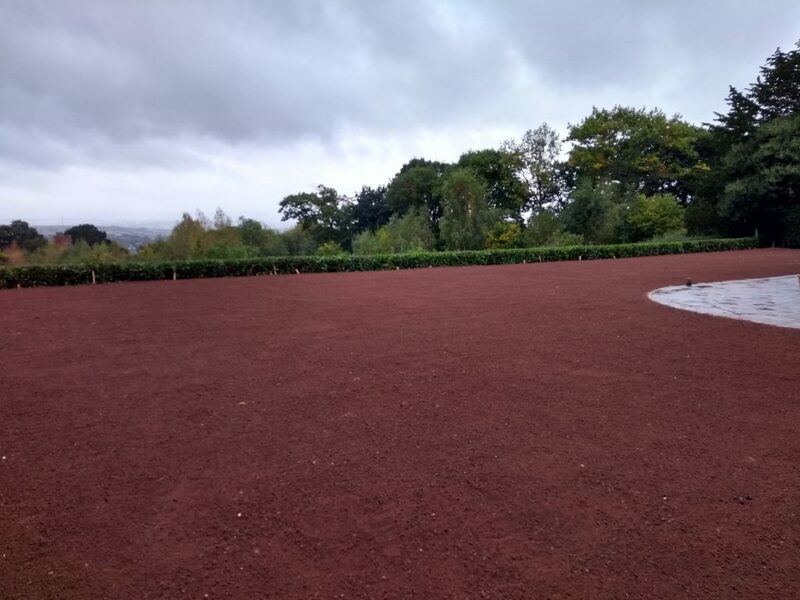 23 tonnes of local topsoil was then applied to the lawn and raked flat. Fresh grass seed was then sown and left to germinate. 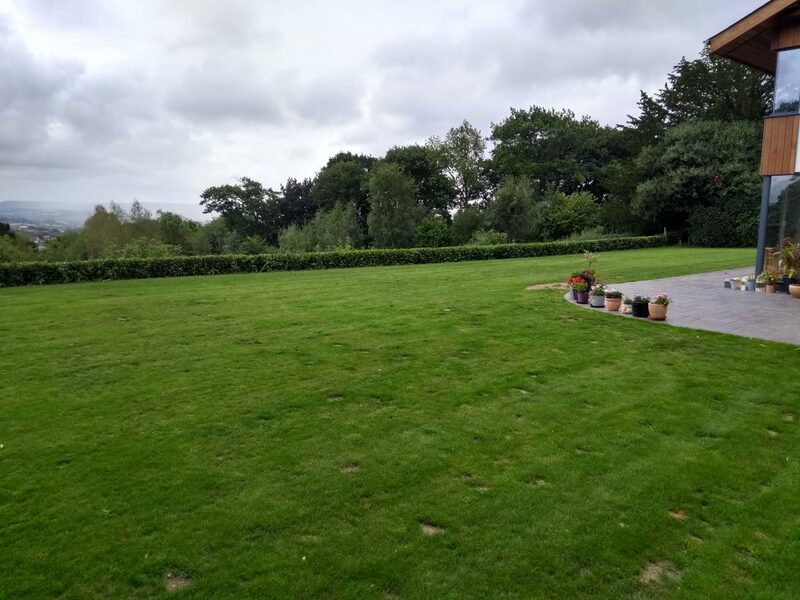 In October 2018, Just 3 weeks after sowing the lawn the grass is coming up strongly. It is a little patchy in places, but this is normal. After a warm, wet winter the lawn grew so much that it needed cutting! Just 3 months after sowing and a couple of mows later the area was transformed. It started to thicken and germination was very even. The lawn regeneration was complete. 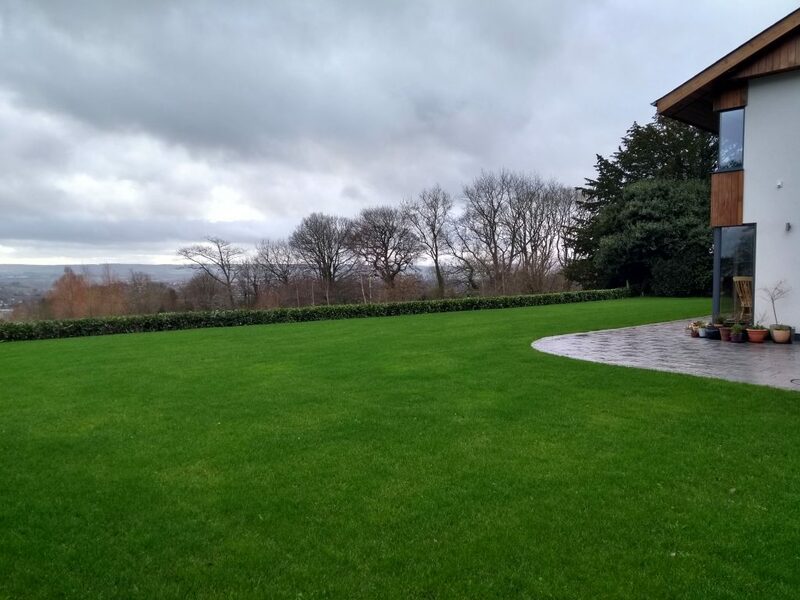 The lawn in January 2019 has been transformed. 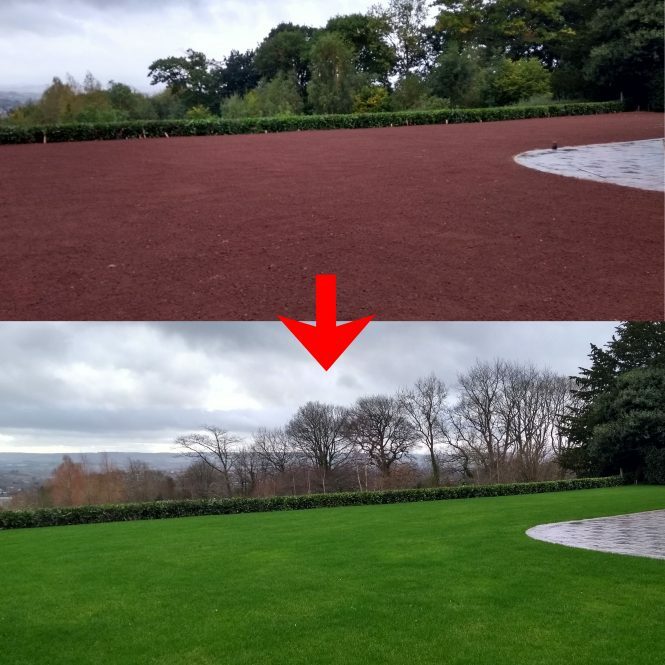 It is still a little thin in places, but for the middle of winter, the lawn regeneration is complete. After a spring feed and regular mowing, this lawn will look fantastic. I will post an update later on in the year. If you live in the Exeter area and are interested in planning a complete lawn regeneration, get in touch and I will happy to advise.